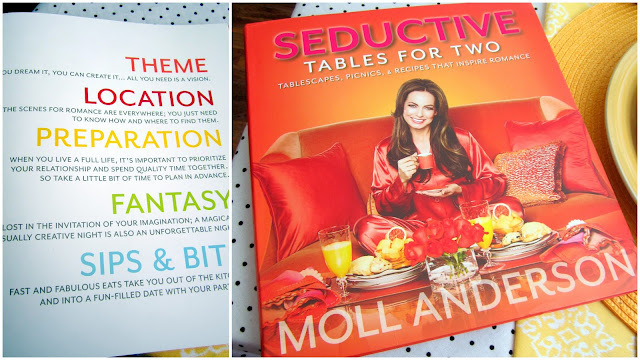 The other day I was shopping at Sam's Club (see my trip here) and as I was browsing through their books I came across Moll Anderson's Seductive Tablescapes for Two. Moll is a lifestyle and romance expert and she has the most creative ideas for how to transform your home into an entertaining masterpiece. I decided that I was going to use her book to bring a little romance into my own home. As soon as I arrived home I read the entire book from cover to cover and then flipped through it again. This book outlines every single detail and makes it easy to create something amazing even if you are not the most creatively inclined person. I loved all of the big photos in the book! I am a visual person and being able to see every detail was really helpful. The book is outstanding and I highly recommend it. This could make for a super thoughtful wedding gift! Winter has been crazy here in Grand Rapids Michigan. We have most recently received a foot of snow and I am finding myself missing spring more than ever. I miss the bright colors of nature and the smell of flowers. I decided that I had to do a spring themed table for two. My husband is also an outdoors-man so I knew he would love it. Our kids have been sick with the flu and home from school all week. My husband and I have been working hard and we needed to enjoy some romantic time together. I started with the color yellow because it reminded me of the sunshine and it swelled from there. I went through my cupboards and craft boxes to locate anything I could use with my theme. I also made a short trip to the local Dollar Tree store to pick up a few more items. I had everything I needed, the fun could begin! I decided to go with our most favorite meal time of brunch. We had fresh ruby red grapefruit, zucchini bread and butter, green grapes and orange juice with a hint of citrus soda. It was the perfect light brunch for two. 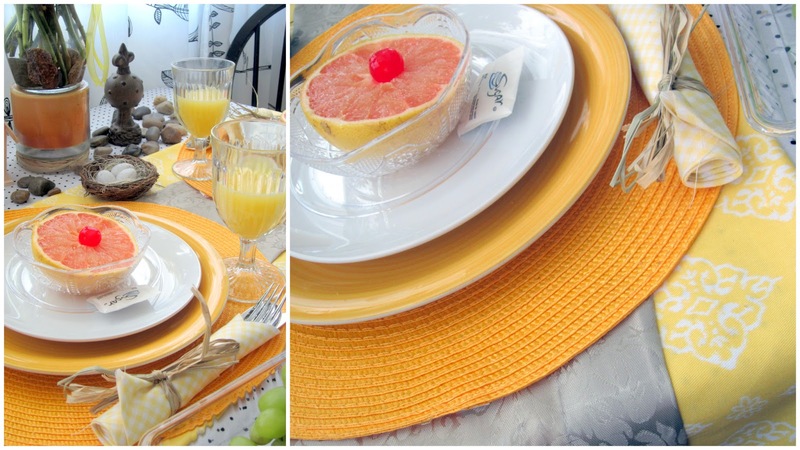 The brightly colored yellow table runner and placemats really added a nice pop of yellow color. 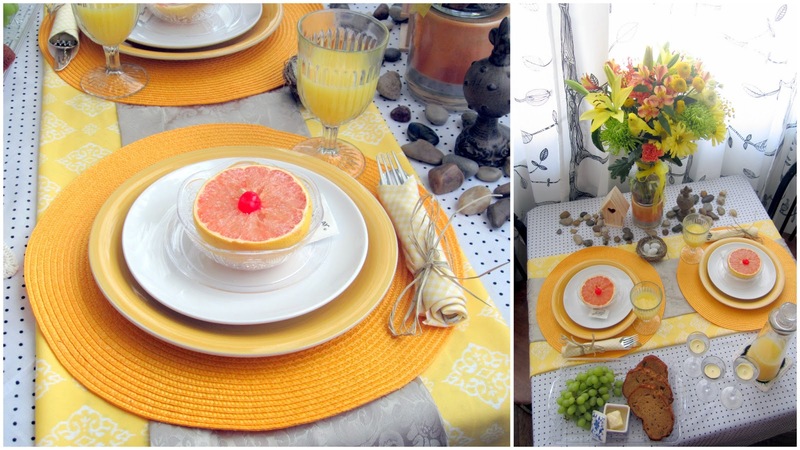 The whole table was cheery and bright, it really reminded us of spring. The flowers that I found at Sam's Club smelled phenomenal! I added some large rocks into the vase that were visually pretty but they also helped prop the flowers up and keep them in place. 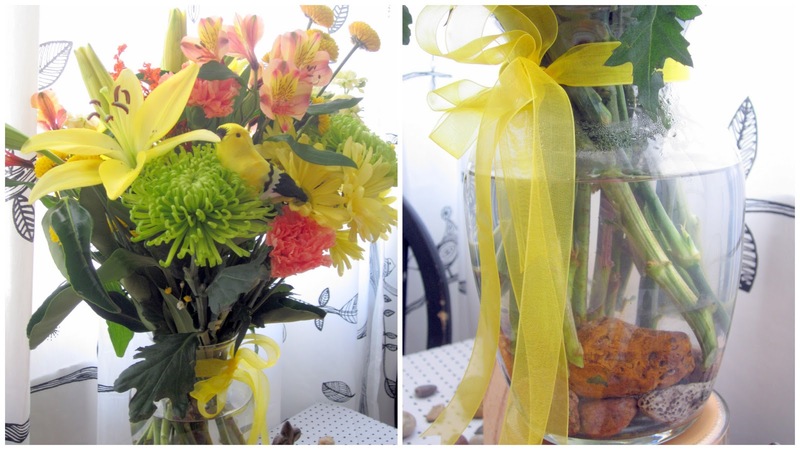 I added some yellow ribbon to my vase that I found at the dollar store. Can you find the little fake bird in my bouquet? I had some old fabric in one of my bins that was white with black polka dots. That fabric went right over top of a boring old beige table cloth. The polka dots sort of made me think of a pin-up girl, it had a sort of vintage flair to it. 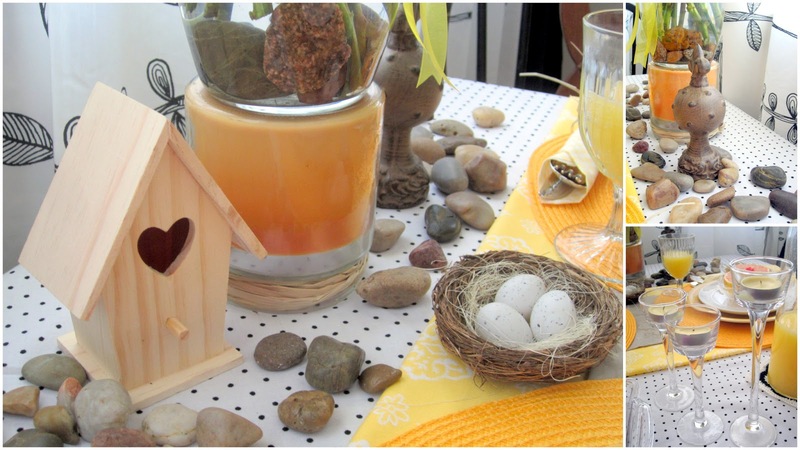 I added another beige colored runner from the dollar store over top of a yellow fabric. My curtains are new from Ikea, the bird and branch print was so cute next to my table and really fit the theme. I placed a big yellow charger underneath of a white dinner plate then on top of that went a clear glass plate which held the glass grapefruit bowl. It all works together perfectly and it took me less than 30 minutes to put this all together! For decorations I had found a bird nest with fake eggs, a little wood birdhouse, a bag of lightly polished stones, some tea-light stands, and a finial all from the Dollar Tree. I didn't want to go too overboard, just simple and fun. I wished I could have found some pine cones but the store was sold out. One of my most favorite things for the table is that small decanter type vessel that you see holding juice. It's vintage and just so interesting to me. I have never used it as a decanter, it does however make the perfect juice pitcher. 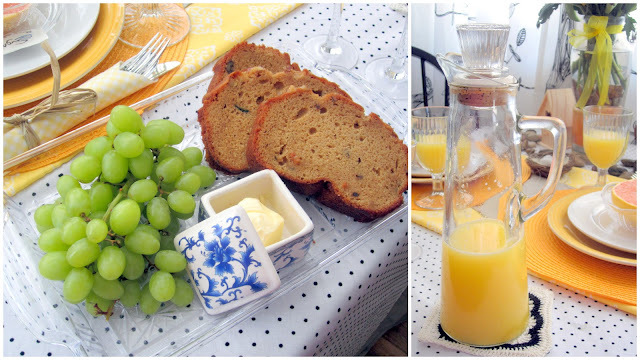 To hold our delicious bread, butter and grapes I used a plastic serving platter that looks like glass. The butter is inside of a small trinket box that is food safe. It's just the perfect size for a table of two. I love how my table turned out. I can really see myself entertaining at home more often. It feels more intimate at home and it cost very little. What kind of romantic table for two theme would you do? Leave a comment!